Announcing the next step in Motorsport Maintenance and Lifing Systems. 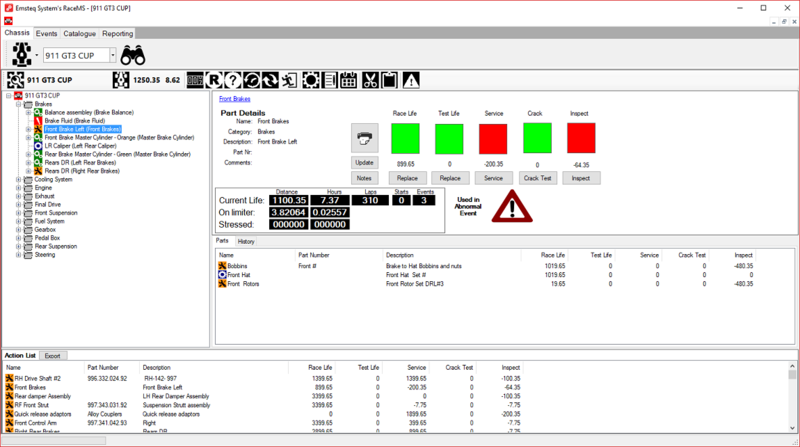 Brisbane-based software company Emsteq Systems has announced details of the long-awaited upgrade of their RaceMS software. Opening the system is the reveals the updated look and feel that accompanies the upgrade. But the big news is under the bonnet. The database is now cloud-based. This means that no matter where the installed software is located, as long as you have an internet connection, you have access. The huge benefit is that there’s no messy split and join database functionality needed and if you wanted the system to be multi-user, there’s no system work needed to achieve that. Just download the app on every PC that it’s needed on. •	Configurable Alerts. Instead of 1 life alert and set alerts for Service, Crack Test and Inspection, there are now 2 life alerts and 4 maintenance alerts. These can be named anything. Want to configure a Race Life and a Test life for parts? Easy! •	All alerts in the system are now displayed as “life remaining”. That is, life until requiring replacement, service or inspection etc. •	Abnormal Event. A track session can be marked as an Abnormal Event if there was a failure or accident. Any part used in that session is then flagged as having been in an abnormal event giving the engineer an immediate flag to track the part a lot closer. •	Duration on Rev Limiter. Widely accepted as a particularly violent event, the system now tracks duration on Rev limit which can be used as a deciding factor on a part’s life. •	Parts Catalogue. The system now has a full parts catalogue that can be used to manage the team’s componentry. This includes being able to set required stock levels and be able to report on them. The other benefit of a Cloud-based system is that RaceMS can now be offered as a subscription. This means that the system is more affordable than ever before. 2016 T.J.N. Pty Ltd all rights reserved.